A diamond colour with the highest grade is the one with the least amount of colour. Diamonds grade as D indicates that it is colourless, and therefore extremely rare and valuable. 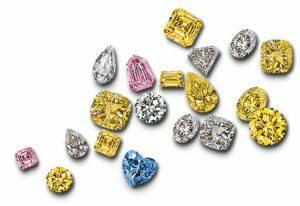 Diamonds graded as E in colour, show minute traces of colour detected by an expert. An F grade indicates slight traces of colour. A stone graded G-H range is near-colourless, with traces of yellow generally visible only when compared with whiter diamonds. I to J are also near-colourless, only slightly detectable to the unaided eye. K-M, begin to display noticeable colour. Colour differences in diamonds are very subtle. To grade diamonds, you have to have controlled lighting conditions. All compared against a master set of diamonds for accuracy. The presence of colour diminishes a diamond’s value. Diamonds come in an array of colours Red, blue, pink, purple and even green. This sort diamond is known as fancy diamonds, extremely rare so command a higher price.